Of course one mouse-click is not enough to produce a project result. 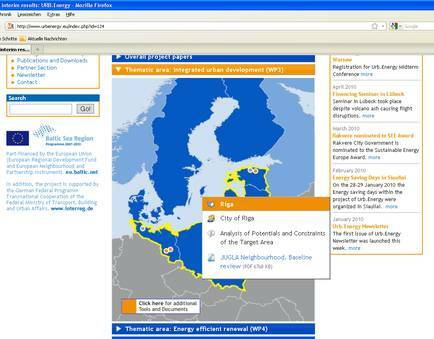 But with one mouse-click it is now possible to access the current outputs of the Urb.Energy partners. As the analytic part of the project is mostly finalized, and the first project findings are documented, the new “result-page” at the project’s website offers an overview about the different interim results that has been developed so far. According to the project progress, the data base will be continuously updated with the latest results. The centerpiece of the data base is an interactive map of the project area and the different partner organizations. At this map, it is possible to select project partner and thematic area and to download the relevant result documents. The new system enables the direct access to all findings of the different project partners, and facilitates the direct peer-to-peer knowledge exchange. Additionally, it offers interested experts the possibility to get informed about the latest findings of the project.